Teach For America undermines the fight for racial justice. As the social justice caucus within the Philadelphia Federation of Teachers, we were surprised to see that you are coming to Philadelphia to speak alongside leaders of Teach For America (TFA). The Caucus of Working Educators is committed to racial justice in our schools and society, and we stand in solidarity with the Black Lives Matter movement. We see Teach For America as working in opposition to the goals of publicly funded education for all students in Philadelphia and to the goal of increasing the number of teachers of color and teachers who are committed to building relationships with communities over the long term, which we see as an integral component of culturally responsive teaching. We view the hiring of cadres of racial, cultural, and geographical outsiders with very little teaching preparation as part of a larger neoliberal effort to privatize education and replace unionized teachers (many of whom are teachers of color) with young, inexperienced teachers (most of whom are white and do not intend to stay in the teaching profession and commit to the long-term improvement of their teaching practice). This practice of displacing African-American teachers, in particular, is already underway. While Philadelphia’s teaching force increased by 13 percent from 2001–2011, the percentage of black teachers dropped by 19 percent. This has contributed to Philadelphia having the greatest disparity between the race and ethnicity of the student body and those who teach them. Only 31 percent of Philadelphia teachers are of color compared to 86 percent of the student body they are teaching. This is unacceptable. TFA has ties and parallels with the charter school movement, which we see as undercutting public education. The mass charterization of public neighborhood schools has led to the outsourcing of public school management to private operators. Just weeks ago Philadelphia Public Schools announced yet another wave of school closures and conversions of public schools into charter schools affecting upwards of five thousand students. This is in addition to the twenty-three public schools that were closed in Philadelphia in 2013. The decision to turn a district school into a charter is often made by the highest levels of administration without consulting with the school community, including parents, teachers, students, and leaders. Your support of Teach For America represents a support of these same kinds of outsourced and contracted paradigms for educating our children. Rather than hiring experienced professionals that will stay in the profession for a long period of time, Teach For America hires individuals with little or no experience in classroom settings via external channels such as private universities and corporately sponsored recruitment. Teach For America and charter schools both represent a failure of public leadership to lead and create change in our public schools, and prioritize outsourcing teaching and school governance over public responsibility to realize every student’s right to a fully funded, culturally relevant education in their neighborhood. Instead, TFA contributes to the dangerous and misleading discourse that claims poverty and structural inequality have little to no impact on educational outcomes. This irresponsible explanation provides Democrats and Republicans alike with a pretext to continue vicious budget cuts to public services and institutions under the guise that “personal responsibility” and “grit” are the main factors in determining a child’s success or failure. We live and work in a state that has the largest funding disparity between wealthy and poor districts and in a city whose externally appointed school governance commission is proposing to continue to close down schools that primarily serve low-income African-American families. In Philadelphia, where 79 percent of the city’s students are black and Latino, $9,299 is spent per pupil compared to the $17, 261 spent just across the city line in Lower Merion, where 91 percent of the students are white. This is the civil rights crisis of our generation. 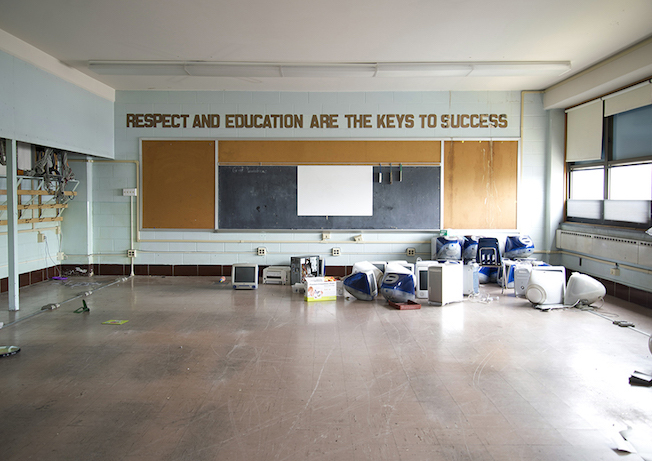 In this context, we believe that it is essential that those who are committed to racial justice take a critical stance against organizations that aim to further privatize education and/or replace fully prepared unionized teachers with underprepared novices who are likely to leave teaching in two to three years. The Black Lives Matter movement has served as an inspiration and instruction on how to confront racism and inequality throughout our country. Part of that inspiration is the way that the movement has looked at the connections between police violence and racism and other inequalities faced by African Americans. We consider the attacks on public education to be a part of the “state-sanctioned violence” that the movement has done so much to highlight over the last year. We do not believe that the white billionaires that bankroll Teach For America and the corporate education reform movement are any more interested in the education of poor and working-class black and Latino children than we believe they are interested in ending police violence in black and brown communities. If they were, these crises would no longer exist. We are glad that you are visiting Philadelphia, and we hope that you will use your platform to engage in a critical dialogue about whether TFA supports — or as we believe undercuts — the goals of a fully funded education for every student in Philadelphia with teachers who know their community and are committed to staying for the long haul. The Caucus of Working Educators is a social justice caucus within the Philadelphia Federation of Teachers.